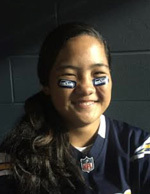 Three Big Island athletes were among a field of 40 national finalists from across the United States who posted champion finishes in the NFL PUNT, PASS & KICK National Finals last weekend in Seattle. Finalists competed separately in five age divisions at the Virginia Mason Athletic Center in Renton, Wash. The top scorer in each group was crowned national champion. The isle athletes came home with two second place and a fourth place finish. The 10 national champions were recognized for their achievement live during Fox Network’s telecast of the NFC Divisional Playoff Game between the Seattle Seahawks and Carolina Panthers. All 40 finalists were provided airfare, hotel accommodations and tickets to Seahawks-Panthers game. Competitors launched two punts, two passes and two kicks with scores based on distance and accuracy (in feet). The best score from each activity was tabulated to determine the athlete’s total. 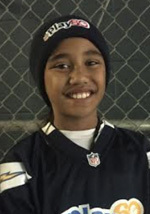 Youngsters advanced to the national finals through local, sectional and team championship competitions held throughout the NFL regular season. The top four scorers in each age group from across the country qualified as national finalists. Established in 1961, the NFL Punt, Pass & Kick program is managed by USA Football, the sport’s national governing body. It is one of the nation’s largest grassroots sports skills competitions. NFL stars – including current San Francisco 49ers quarterback Colin Kaepernick and Pro Football Hall of Fame quarterbacks Troy Aikman and Dan Marino – competed in the Punt, Pass & Kick program as youngsters.